America's entry into the Western world is the result of a process whose first phase, from the discovery by Christopher Columbus in 1492 to about 1570, when much of the continent had been transformed into an Iberian territory, entailed the violent destruction of the many native American civilizations and peoples. A longer view, however-from the discovery through the first colonization in the early seventeenth century-shows that precisely because the Amerindian populations declined so rapidly, both natives and Iberians were practically forced to build novel forms of cooperation. As the conquistadors were conquered by a plurality of Amerindian forms, the conquered Amerindians began a process of creative reconstruction that would slowly bring them culturally closer to the Iberians. In describing how Latin America became Westernized, starting with its discovery by Europe, it is important to note the twofold process of an initial collision between Iberians and Indians in the sixteenth century followed by the cooperation that would define the central phase of colonization, from about 1630 to about 1750. Still, even the collision phase saw trial and experimentation as both groups could not change their historical and cultural reference points quickly enough to accommodate their new reality, one whose outcome was still uncertain, since in the early sixteenth century Iberians and American Indians were only potentially conquerors (conquistadores) and conquered. 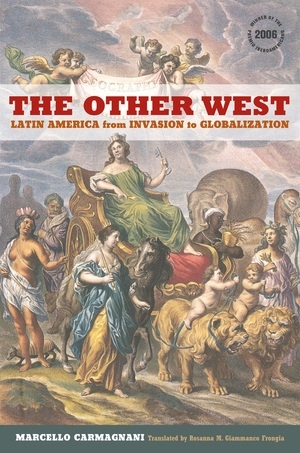 Although today we regard Europe and the Americas as groups of nations that also have a continental history, not only geographically but especially culturally, throughout the sixteenth and the early seventeenth centuries Amerindians and Iberians had essentially a local vision of their history and culture that offered no framework for interpreting their new experiences. During the phases of clash and cooperation that marked the entry of the Latin American territories into Western history, Spaniards, Portuguese, and Amerindians gradually began to perceive the links between the different areas of the New World and between the New World and the Iberian regions from which the conquistadors had come. Because the European invasion was not simply a matter of arms but also entailed the use of cultural and organizational resources by both parties, I will begin by reviewing the situations of both groups at the time of the conquest, trying to identify what connections might have existed between those who would become the conquered and the conquerors. Because spontaneity is a distinctive trait of conflict and cooperation alike, annexing the Americas to the Spanish and Portuguese monarchies was no simple undertaking, and its success was in no way inevitable. In fact, in the period from about 1570 to 1600, a number of contrasting trends emerged: the feudal conquistadors and their offspring existed side by side with Iberian-type municipal councils; the latter enjoyed royal privileges and thus came into conflict both with the seigniorial expectations of the conquistadors and with the monarchy. At the same time the native Indian structures continued to fill an important role in many colonized areas, and the perseverance of the native lords and the native Indian nobility helped to mitigate the millennialist longing for a return to a pre-Hispanic life that would otherwise have led the natives to revolt. Thus the royal officials did not find the West Indies easy to manage, either politically or economically. During the invasion and the early phase of colonization, the Europeans established new modes of interaction to ensure that the New World would continue to remain part of the Iberian monarchies. Before the Spanish and Portuguese invaded and conquered the Americas, the various native societies had a history of almost forty thousand years, starting with the migration of Asiatic peoples who had reached the continent by crossing the Bering Strait as well as those who had come by sea from Oceania. As the continent that was the last to know the presence of humans, and the only one whose cultures evolved without any contact with Europe or Asia until the arrival of Europeans in 1492, America (or the Americas, since they are technically two continents on one landmass) is unique. Throughout its prehistory America was marked by the presence of highly diverse populations with different cultures that had little communication; there was also little exchange between the north, center, and south. This diversity is not a negligible factor: because of it, the Europeans, starting with Christopher Columbus, were able to invade the continent between 1492 and 1570. It is important to remember the great differences in language, environment, economy, culture, and even organization of the native peoples, lest we forget that the so-called "Indian" identity was an Iberian construct that lumped together and unified the highly heterogeneous native populations. These groups included nomadic, seminomadic, and sedentary populations. One feature that distinguished the various Indian societies was the cultivation of plants and the domestication of a few animals. From about 5,000 to 3,000 B.C. the Americas underwent a neolithic revolution similar to that which occurred on other continents; as a result some societies moved to an agricultural phase and developed specific practices of diet and culture that still partly exist today in Latin America. The cultivation of maize, potato, cassava, chili pepper, quinoa, beans, pumpkin, and avocado, as well as the domestication of the dog, turkey, llama, and guinea pig, characterized Mesoamerica (Mexico and Central America); cassava and sweet potato, the Caribbean, or the Tropics; and potatoes and the llama, the Andes (from Ecuador to northern Argentina). The advent of agriculture was not only a material event but a cultural one. It led to the transition from roving hunter-gatherer groups of no more than 150 to 200 individuals, following a leader and a shaman, to tribal organizations of gatherer-hunters who farmed, had a stable base-the village, which was also their ceremonial center-and developed a complex political and religious structure. This transformation took at least two millennia, with the transition from farming tribes to settled farmers occurring about 3000 to 2500 B.C. Starting in about 200 B.C., the great Aztec, Maya, Chibcha, and Inca civilizations arose from these seigniories (city-states ruled by a monarch or lord), or princedoms. This anthropological sketch shows that all native Indian organizations, from the hunter-gatherer clans to the more culturally evolved societies, were extremely complex and dynamic and that the evolution experienced by only some of them was not due to greater skills or mental capabilities. Like the transformations in ancient European societies, this evolution grew out of choices dictated by opportunity and need. These choices are expressed, for example, in the language of each culture, since language reflects the system of categories and the structure that the human builds in relation to objects and beings. It follows that no language is elementary because, as Jacques Soustelle paradoxically comments, "of the American Indians I met, the less civilized, the more complex they are" (Soustelle 1967). Although they were equally endowed with the potential to evolve, not all Amerindian societies made the transition from clans to tribal organizations and from tribes to states. The Mesoamerican and Andean civilizations became great not just because of the opportunities afforded by demographic growth, technological advances (irrigation, roads, silos, etc. ), bartering of goods, or the need to manage resources but also through the development of a collective imagination, as evidenced in the calendar and the elaborate religious and political hierarchies. All this led to the birth of complex state organizations ruled from architecturally sophisticated cities, still visible in the ruins of Teotihuacán, Chichén Itzá, Tikal, and Cuzco. A clearer idea of the cultural diversity that existed when the Europeans arrived on the American scene emerges by correlating the (estimated) population of the different regions and the prevailing type of organization. Although the available information is fragmentary, it is possible to estimate that at the end of the fifteenth century half of the natives lived in complex state organizations and about three-fourths had lived through the neolithic revolution. Before the arrival of Europeans, America was already a complex and dynamic world; the idea that it was static took hold after the conquest for political and ideological reasons (just as ideological is the current idea that, unlike those of Europe, native American societies were harmonious and egalitarian). Precisely because they were dynamic, both clan-based and state-based organizations had to forge systems of social discipline, a clue to the high degree of tension and conflict that marked all American Indian societies. Hunter-gatherer clans were organized around the extended family, with matrilocal residence, and were always on the move over a vast territory in search of food, carrying with them their bows, arrows, nets, provisions, and the skins of captured animals. The last were the principal barter goods and also served to reinforce lineage bonds, as the skins were distributed to the women, who would make garments out of them. The extended family was also the basic unit of tribal societies, with the village frequently inhabited by two or more lineages, for farming reasons and for the greater hunting and food-gathering resources that the arrangement produced. Thanks to these more abundant resources, the elders were gradually exempted from work, for age raised one's social status and prestige and was to become the basis of the shaman-chief's authority within the tribe. In addition to these two types of organization, at the time of the conquest America had two empires-the Aztec and the Inca- and each in turn subsumed numerous city-states. City-states also existed in Central America, Colombia, Venezuela, Ecuador, northern Chile, northwestern Argentina, and in some parts of the Amazon. All these organizations were the result of a chain of internal transformations, migrations, and intercultural contacts that left their mark in art, astronomy, mathematics, architecture, and engineering. By virtue of long experience and many trials and errors, empires and city-states efficiently managed their diverse environments. They successfully governed large populations through numerous complex systems of discipline and hierarchy that gave different degrees of access to community goods and services. Unlike clans and tribes, empires and city-states were able to withstand the collision with the Europeans precisely because they had reinforced the clan-based structures that were common on the subcontinent. Two clan-based organizations were particularly important: the calpulli, which was typical of Mesoamerica, and the ayllu, which was widespread in the Andes. Both still exist today in many regions of Mexico, Colombia, Ecuador, Peru, and Bolivia. As I have noted, the neolithic revolution gave rise to farming villages that facilitated the shared use of a territory by two or more extended families. In addition to an economic and social function, the Mesoamerican version of this clan system-the calpulli-also filled a political and cultural need because it grouped together several extended and nuclear families that were related to each other, on condition that they all recognize the same divinity as the protector of the entire clan. This homage was for the divinity that had taught the calpulli members a trade, craft, or skill useful to the clan as a whole and meant to be passed down to the next generation. The religious foundation of the calpulli helps explain why the clan owned all local resources, including land and water. Clan authorities assigned the calpulli members their plots of land and the amount of water they needed to irrigate it. The authorities also managed the village's unassigned land, whose crops supported the nobility, the priestly class, and the lord or emperor. The mechanism for allocating resources to the emperor, lords, and officials was the tribute, an institution that predated the Aztec Empire, undoubtedly born in the final stage of the population's transition to sedentary life with the concurrent rise of a network of villages linked by barter. The calpulli was at once the foundation of the material and spiritual life of the village and its members, and the first level in the vast seigniorial (and later imperial) political organization. The Andean ayllu had the same dual significance as the calpulli; however, the ayllu put more importance on the role of the territory. The ayllu was a grouping of families believed to originate from a common ancestor in a specific geographic location. Before they began conquering the many Andean seigniories in the second half of the fifteenth century, even the Inca were no more than a territorial seigniory comprising eleven ayllu near Cuzco, in the southern Andes. The ayllu's religious reference point was the ceque, an imaginary line linking the ayllu to a sacred place. The close link between religion and society was thus a common trait of Amerindian societies. In Mayan and Aztec Mesoamerica this link was manifest in the idea that humans are merely the expression of a twofold divine will, one ruling the upper region-heaven-and the other ruling the lower-Earth. The Andean conception of the world was similar, for they believed that the interaction of the material and the spiritual world informed the principles of Inca society: tripartition, dualism, and the imperial tithe. Tripartition establishes the relation of sacred and secular points, the latter visible in the territorial division into districts. Dualism sanctions the idea of the integration of unequal parts of an ayllu through exogamous marriage. Finally, the tithe defines the political-administrative structure of the empire, especially the tribute system. Thus Amerindian societies are anything but simple to describe or to understand. It is true, however, that the closer they were to an imperial-type organization, the more stratified they became. The result was an entrenched reverential fear of one's superiors-the elder, calpulli chief, local priest, merchant, warrior, and, obviously, the lord or dynastic ruler. The lord (tlatoani in central Mexico, batab in the Yucatán, kuraka in the Andes), called cacique by the Iberian conquistadors, was the end result of a cultural, political, and social process begun several millennia before the European invasion. Therefore a stratified structure was the distinctive trait of Amerindian societies, visible in the distinction between nobility and plebeians and in the different ranks within these. As I have noted, this strong regimentation was rooted in the belief that the divinity alone is eternal, while humans, and even nature, are extremely fragile. Although a stratified society made possible significant changes in production and better management of the resources needed to support a growing population, it also led to strain and conflict. Entire ethnic groups were wiped out for rebelling against the emperors, thousands were subjected to forced migration, and infighting erupted to replace lords. Various forms of temporary slavery, as well as human sacrifice, were especially widespread in the Aztec Empire, testifying to the tension between conflict and cohabitation that marked Amerindian societies, just as it did societies worldwide. The perennial state of conflict in which the nobility and the plebeians lived became crucial at the time of the conquest, because it fostered alliances and ententes with the invaders. In Mexico an Indian lord-a Zapotec from the Oaxaca region-proposed an alliance with Hernán Cortés for the purpose of subduing a powerful Mixtec seigniory. And because of an alliance between the Spanish invaders and the Tlaxcaltec people, Cortés was able to storm Tenochtitlán, the capital of the Aztec Empire. Similarly, when the meager Spanish expedition led by Francisco Pizarro and Diego de Almagro set foot in Inca territory in 1532, the Spaniards adroitly exploited the complex political game between Atahualpa and Huáscar for succession to the throne of Emperor Huayna Capac, who had died in 1527. Such ententes were more numerous than one might think. One telling example came in 1561, when the lords of Hatun Xauxa, in the Peruvian altiplano, demanded that the Spanish authorities return the goods delivered to Pizarro in accordance with the alliance the lords had formed with him to subdue Atahualpa in Cajamarca. Conflicts within Amerindian groups also led the conquistadors to try to forge alliances with the tribal chiefs. Because of these ententes, the French and the Portuguese were able to settle in Brazil, where Portugal's alliance with the Tupinamba enabled it to defeat the French. The colonization of Chile and the founding of Santiago de Chile were made possible by an agreement that the conquering captain Pedro de Valdivia reached with the local chieftain. The fact that the natives possessed skills and capabilities enabling them to work out strategies as complex as those of the European invaders sheds light on the plurality of forms that European penetration was to take in the Americas. This plurality can be seen in the natives' acceptance of a coexistence with the Iberians and, conversely, the Iberians' need to constantly adapt to the different realities in which they had plunged. Ultimately, the invasion and conquest of the Americas represented not only the violent destruction of a world but also the creation of a new reality through the intertwining of two different worlds, not necessarily on an equal footing. The cultural background of the Iberian invaders, for whom religion was the foundation of political and social action, played a primary role in the interactions between the conquered and the conquerors. Embodying their worldview was the idea of a res publica christiana, with throne and altar united, coexisting with the linguistic, cultural, political, and social specificities of the empire's various realms. It is significant that the Iberian invasion took place under Holy Roman Emperor Charles V, in many ways the archetype of the transition from the medieval to the modern monarchy. If the native Indians were not the savage barbarians destined to be brought to the true faith by the Spaniards and the Portuguese, as depicted in sixteenth-century Catholic chronicles, neither were the invaders the coarse, uncouth, obscurantist, and superstitious men depicted by anti-Spanish publications in the same period. Both images are oversimplifications that focus on the violence and abuses of the invaders, which, though certainly grave and numerous, should not obscure the many instances of coexistence between Iberians and Indians. Both the invaders with their captains and the native masses with their lords and noblemen had a wealth of cultural resources on which they drew, once the initial shock had passed, to work out strategies of adaptation and develop mechanisms that would generate new codes of behavior and patterns of social life. Most of the Iberians who came to the New World were natives of Castile and southern Portugal, among the most dynamic and densely populated regions of the peninsula. They tended not to be peasants but rather city dwellers, most of whom could read and write. Some captains, such as Hernán Cortés and Pedro de Valdivia, and almost all the Portuguese donatários (recipients of the king's largesse) in Brazil were well educated men of Renaissance culture. The Iberian invaders-the conquistadors-were a small number indeed: in the sixteenth century fewer than 100,000 Iberians set foot in America, three quarters of them from Castile and the rest from Portugal. Between 1506 and 1560 only 1,588 Iberians arrived each year, a minuscule number compared to the total Indian population of about sixty million at the time of the conquest (dwindling to perhaps less than half that number in the last third of the sixteenth century). Who were those few thousand Iberians? What were their cultural traditions and their ways of thought, and how did they define themselves vis-à-vis the natives? Too little is known about them, except in the case of the royal officials and the churchmen. The former, who came late on the scene, had studied law at the universities, the latter, never numerous enough for their task of evangelization, had studied in the special colleges founded by their various orders. Apart from that, the only relatively reliable fact is that most conquistadors tended to call themselves hidalgos (Spanish) or fidalgos (Portuguese), which meant that they had some inherited social distinction that exempted them from the personal tax. This title gives some indication of the cultural tools that enabled the Iberians to carry out their enterprise in spite of their apparent disadvantage compared to the natives in terms of both numbers and organization. Recent studies note a significant increase under Isabella the Catholic in the naming of hidalgos and knights, ranks exempt from tribute, in response to the political and military situation and the conquest of Granada, the last Arab outpost. As a result, the lower nobility constituted, at the time of the discovery of America, at least one-tenth of all Castilian families-a far greater number than in previous periods. Still, the expansion did not affect the number of Castilian families at the upper end of the aristocracy, which remained at about one hundred, the same number that existed at the end of the fourteenth century. The large increase in the ranks of the lesser nobility cannot be dissociated from the importance that Castile took on as it reconquered the Iberian regions held by the Arabs since the first half of the eighth century (711-50). With the culmination of the centuries-long process of reconquest in 1489, and with the union of the crowns of Castile and Aragon, the hidalgos could no longer gain honors, wealth, and prestige in service to the king at home. Thus the reconquest gave way to the conquest, as the hidalgos left Spain for the New World. The conception of nobility inherent in hidalguía was rooted in medieval chivalry, but this form of honor was increasingly linked to prestige as new importance was given to family wealth. Hence, the political and social culture of the lower nobility experienced a renewal, because other social groups that served the crown, whether administrators or members of the merchant class, could now use their wealth to rise into the aristocracy through marriage, friendship, or clientelism. The spread of the culture of nobility led to a relative reduction of the warrior class of nobles as it extended nobility to social groups with wealth but no noble lineage. In the American context the concept of nobility is apparent in the conquistadors' ability to elevate their social status by serving the crown and the Church. The reports to the king enumerate the services they performed, for which they reaped rewards similar to those their predecessors in Spain and Portugal had earned by fighting the Arabs. The Portuguese donatários were those rewarded with royal donations (donatarias) of vast regions in Brazil, while the Spanish conquistadors and their descendant received encomiendas entitling them to the tribute that the Indian villages were forced to pay the king. The royal donations, grants, and rewards to the new magnates were not just a Portuguese or Spanish phenomenon. This was a custom of the European monarchies in the sixteenth century. Only in the next two centuries would the centralization of politics and administration in the hands of the king and his officials put a stop to these rewards. When the invasion of the Americas began, the European monarchies still retained vestiges of the medieval parliamentary monarchy, such as the convocation of the estates and of the city representatives to the Cortes (parliaments) of Castile and Portugal and the presence of the high nobility in the royal councils. Castile and Portugal were unique for having such a large noble class, one left with no possibility of further improvement following the reconquest of the Arab-occupied lands. When the count-duke of Olivares, who was prime minister to the king of Spain, tried in the early seventeenth century to implement reforms to stem the decline of the monarchy, he came up with an interesting classification for the Castilian nobility, designating them as infantes (the king's children), grandees, lords, knights, and hidalgos. The first three, he wrote, were expected to serve the Catholic kings in managing the kingdom and the empire and thus had to spend part of their income to maintain their royal offices. Members of the fourth category, the knights who dominated local politics by occupying municipal posts, were required to serve in the military. As to the hidalgos, the count-duke made a distinction that sheds light on the character of the conquistadors. He divided them into subclasses: the solariegos, who had some financial standing as property owners; the privileged hidalgos, who had acquired their hidalguía through a royal donation; and those who had neither property nor titles but were considered hidalgos by popular acclamation. A final group enjoyed hidalgo privileges only in their place of residence. With these distinctions in mind, it appears from the biographical information available, the firsthand accounts of the conquistadors, and our knowledge of the earliest Spanish and Portuguese inhabitants of the Americas, that most of the conquistadors belonged to these last two groups: they were hidalgos only in their place of residence or were popularly known as such, and had left home to seek fortune, first in the imperial armies and later in the Americas. The Iberians had a multicultural background, as they came from areas with a strong Arab and Jewish presence. Seville and Lisbon, in particular, also had a large population of African slaves. Might this background have aided them to some extent in dealing with other racial and ethnic groups? Also significant is the fact that when the Catholic kings left Granada, they entrusted the government of the reconquered region to a triumvirate that included Hernando de Talavera, the first archbishop of Granada, who advocated tolerance and openness toward Muslim culture and religion. One experience that affected the hidalgo class that reached the American shores was the Castilian and Portuguese expansion in Africa in the fourteenth and fifteenth centuries. The Iberian penetration in Africa intensified in the fifteenth century, when competition with the Genoese and the Venetians began. Interestingly, at the end of the fifteenth century Seville had forty-four mercantile firms from Genoa, twenty from Florence, ten from Venice, and seven from Portugal, plus some English and Catalan enterprises. The situation in Lisbon was not much different, though that city was better connected with the merchants of Antwerp, Bruges, and London than Seville was. The Iberian expansion in Africa (and later in the Americas) was also an extension of Spanish and Portuguese activity in the Mediterranean, which was visible in their trading stations scattered along the African coast. Soon they began expeditions to bring slaves from Africa as well. In 1444 a chronicler described the African slaves disembarking in Lisbon: many were white, he wrote, others mulatto, and still others "black like Ethiopians." The African expeditions of Prince Henry the Navigator, for which he had secured an exclusive license from the king of Portugal in 1443, were funded with profits from the slave trade. The Castilians also adopted this logic, and many ships holding royal licenses competed with the Portuguese, even attacking their vessels and their trading stations. The Portuguese retaliated, for example, with their constant forays on the Castilian-held Canary Islands. The Portuguese and Castilian expansion into the Atlantic also resulted in the gradual colonization of the Azores and Madeira by the Portuguese and the conquest and settlement of the Canary Islands by the Spaniards. Although the Portuguese king took over deserted islands, the Castilians first colonized the Canaries by establishing seigniories on the islands of Lanzarote, Fuerteventura, and Hierro, many of whose natives had been captured and sold into slavery in the early fifteenth century. The definitive conquest of the Canaries (especially the rich, densely populated islands of Gran Canaria, La Palma, and Tenerife) occurred between 1492 and 1496 and was initially managed by the crown; later, it became a jointly financed enterprise of traders and conquistadors, as would likewise be the case for the Americas. Some Genoese traders who took part in the Canarian venture would also finance Christopher Columbus's trips. The conquest of the Canaries, in which the conquistadors exploited to their benefit the rivalries of the local chieftains, was practically contemporaneous with the discovery of the New World, thus underscoring the continuity of these forms of expansion. Not long after Christopher Columbus's momentous landing on a small Caribbean island in 1492, Vasco da Gama reached India (1498), and Pedro Alvares Cabral discovered Brazil (1500). By the time Columbus died in 1506, Europe had already felt the first winds of change blowing in from the New World, even before the new continent was named America. Notwithstanding Columbus's self-interested stubbornness, most Europeans considered these new lands the new Azores, and the rest believed they were the antipodes. Although intensive exploration of the Caribbean and the first contacts with terra firma took place between 1492 and 1513, only in 1521, when the Spaniards came upon the Aztec Empire (the Mexica Triple Alliance), would a new phase of the invasion begin. In the twenty years between Columbus's discovery of the lands known as "islands and terra firma of the ocean sea" and the first invasion of Mexico, the Spaniards had founded numerous settlements in the Caribbean. Many, however, were no more than entrepôts for the Columbian enterprise of commercial colonization that was dissolved in 1499; indeed, few of these settlements had received the title of city, which would reflect a firm presence in the territory. These entrepôts show an organizational continuity between the Mediterranean and the New World, as well as between reconquest and invasion. This last element is formalized in the Capitulations of Santa Fe signed by Queen Isabella and Christopher Columbus in 1492. This document was a contract similar to those signed between the monarch and a captain during the centuries of reconquest, whereby the captain was to reconquer and repopulate the lands held by the Moors in exchange for rewards and titles of nobility. The Capitulations of Santa Fe granted Columbus and his descendants the title of viceroy and admiral of Castile and specified that the monarchs and Columbus would share equally the revenue from the commercial and economic exploitation of the new territories. However, the new lands would become the monarchs' personal property. Reports of gold on Columbus's first trip led to the establishment of a business on the island of Santo Domingo (Hispaniola) managed directly by Columbus. Everyone arriving from Castile was put to work under his authority, exchanging European goods for the gold extracted by the natives. Thus the basic activity of this Columbian enterprise, like that of the African entrepôts, was the barter of goods. The monopoly held by the crown and Columbus turned out to be poor business, however, because tribal life on Santo Domingo and the other Caribbean islands was organized around subsistence farming of cassava, sweet potato, yucca, maize, beans, and pumpkin. The Indians collected whatever alluvial gold there was purely for religious and ornamental purposes, and even though the Spaniards coveted it, it continued to be the rarest of goods. The royal-Columbian enterprise failed to grow, and the king considered closing it. But the entrepôt workers themselves struck the final blow when, in 1497, they rose against the monopoly and requested authorization to deal directly with the natives. The 1497 rebellion signaled the real beginning of the invasion of the Americas. Having revoked the monopoly in 1499, the crown began to grant licenses to individuals and companies for trading both between Spain and the Antilles and within the Antilles territory. A royal agency established in Castile in 1503, the Casa de Contratación de las Indias, subsequently regulated trade; modeled on the Portuguese Casa da Índia in Lisbon, it granted licenses, regulated trade, and collected the taxes owed to the crown. As a result royal officials made their first appearance in the Antilles. The new trade satisfied both the Spanish settlers and the monarchy, which sought to block Portugal's expansion and enforce the jointly signed treaty that allocated maritime space. In fact, the Treaty of Tordesillas (1494) reprised the contents of a 1493 papal bull that assigned to the Catholic king the lands discovered by Columbus, while revising the demarcation line to 370 leagues west of the Cape Verde Islands. In this new phase the Spanish king had to find a way to reconcile conflicting interests-those of the settlers and those of religion outlined in the papal bull, which called for the evangelization of the natives-while still enforcing his own sovereignty over that part of the world. The Spanish monarchy had by then set out on a path that would lead, under Charles V, to a composite monarchy with universal or imperial characteristics in which political and ethical principles coexisted in the link between throne and altar. The still unexplored American regions took on a new significance in the king's imagination and would occupy an important place in the crown's political and religious plans for more than two centuries, in spite of the changes that occurred during that time. The new directions that the Spanish monarchy embraced as it was about to become the first great modern power were difficult to implement. Once the era of Columbus was over, the monarchy granted several licenses to Castilians for trading with the Antilles natives, but the low quality of alluvial gold, the difficulty in fishing for pearls, and the small agricultural surplus offered for barter ultimately transformed the merchant companies into veritable armed bands that raided Indian villages and captured the natives for use as slaves. These armed merchant bands were essentially conquest enterprises, whose partners and financial backers included royal officials, churchmen, and the stewards of the great Castilian and European mercantile firms that had their offices in Seville. In time the Iberian invasion of the Antilles led to frequent uprisings, the Indians having tired of the conquistadors' treachery. Obsessed with gold and pearls, the Spaniards armed themselves with swords, spears, and crossbows and went about with vicious dogs as escorts. Sixteenth-century Europe learned about the horrors of the invasion through the Milanese Gerolamo Benzoni; his narrative, enhanced by Theodore de Bry's vivid illustrations, was the first book to disseminate anti-Spanish and anti-Catholic sentiment in Europe. Nevertheless, the armed bands in the Antilles were, in effect, a vanguard. They built the first Spanish settlements by using their own weapons and goods for barter. More than just a commercial enterprise, they evolved into a political organization whose members had to obey the oldest or most respected of them, the caudillo (leader). When the settlements became stable and turned into cities, these bands took on an institutional character, forming muncipalities, each of which had its own government, the cabildo, or municipal council. With this transformation the bands became truly conquest enterprises-that is, sociopolitical organizations-rather than mere commercial ventures. The forays of these armed merchant bands, however, soon alarmed both the crown and the Church. Concern grew after the 1520s rebellion of the Castilian cities, which was harshly quelled by Charles V, who feared that the Castilians overseas might likewise aspire to independence. For its part, the Church pressed the monarchy to defend the Indian populations, which had already been decimated in the Antilles. To counteract the breakaway tendencies of the expeditions of conquest, the crown installed an audiencia in Santo Domingo. This was the first governmental and juridical body in the New World. Patterned after the Castilian audiencias, it consisted of a council of judges appointed by the king and charged with ruling the territory and administering justice. The position of royal commissioner (adelantado and alcalde mayor) was discontinued, although without putting an end to the expeditions of conquest. Several of these expeditions reached Tierra Firme and the Gulf of Darién (Castilla del Oro, now Panama), and the pearl-rich Cubagua and nearby islands (Venezuela). In the meantime sugar production began in the Antilles, and sugarcane soon would become the leading Caribbean crop for several centuries. Merchant shipping and sugar production enabled the first American treasure to arrive in Spain: between 1503 and 1510, some 200,000 ducats a year were unloaded in Seville, of which 70 percent went to the merchants. The remaining 30 percent were taxes collected in the New World. The effort to strengthen the king's authority in America intensified the activity of the Church, especially the religious orders, which made public pronouncements in favor of the Indians. As a result of Church pressure the Spanish enacted the first laws protecting the natives, known as the Laws of Burgos, in 1512. Thus, alongside the economic and social interests, spiritual interests began to take shape, resulting in the increased presence and influence of royal dignitaries and churchmen. Despite these political correctives, the Spanish invasion of the Antilles took a heavy toll. The population of the island of Santo Domingo shrank from 3.7 million in 1492 to a mere sixty-six thousand in 1519, a loss that prevented the birth of a Spanish-American society, which would emerge later on the subcontinent. The Brazilian regions were similarly affected, as the Portuguese crown tried to assert its sovereignty in Brazil in keeping with the Treaty of Tordesillas. To reach its goal without any outlay of resources, Portugal granted an exclusive license to Fernando Noronha's merchant company to cut and ship the trunks of the tree known as brazilwood, which was used to produce a red dye. As had been the case for the Columbian enterprise and for African trade, the Noronha monopoly installed trading stations where the precious trunks harvested by native tribes were bartered for Portuguese and European goods. But here too the monopoly system soon grew rife with problems, not because of disagreements between the partners and the Portuguese employees but because of competition from the French, who were also interested in the precious wood. The arrival of the French in the New World was the first in a long series of infiltrations by European countries that refused to recognize the division of the New World between Portugal and Spain. The clashes between the French and the Portuguese helped sharpen intertribal conflicts as tribes would ally with one or the other. Most likely, the situation exacerbated human sacrifice practices and promoted the intertribal trade of Amerindian slaves, which was previously unknown. The trading between invaders and natives led to the first mixed-race unions and the birth of the mameluco (the Portuguese equivalent to the Spanish mestizo), which contemporary Brazilian nationalism identifies as the prototype of the Brazilian. The European invasion of Brazil was very bloody as well: about 2.5 million Tupi and Guarani who lived along the coast died. The devastation of the native populations caused by the spread of European epidemics, tribal wars, and slavery prevented the rise of a Portuguese-American society, as had been the case in the Antilles for Spanish-American society. In the sixteenth century the Spanish monarchy born of the union of the crowns of Castile and Aragon accelerated its imperial designs. With the ascent of Charles V to the throne in 1517, an empire comprising a plurality of realms, with laws and institutions founded on widely dissimilar cultural and political traditions, came into being. Charles V's empire did not destroy the many cultures within it: the innovation was that he allowed them to live side by side, united under a common system of symbols. Elements of this system included the Catholic faith, a court that could assure the subjects' loyalty to the crown, and an administration that could convey to the emperor the needs of each different realm. The new empire was a mosaic with tiles of different shapes. Although these pieces did not fit together perfectly, the whole projected an image of unity-a unity that the Spanish monarchy would not actually achieve, or even seek, before the eighteenth century. The Portuguese monarchy projected the same image. In both cases, the monarch was seen not as the king of Spain or Portugal but rather as the ruler of a number of European and American kingdoms. The element that brought unity to both Iberian monarchies was thus the figure of the king as a symbol of justice and a defender of the faith-he who metes out justice, rewards the good, punishes the evildoers, and enforces respect for the rights and duties of each subject as dictated by social rank. This was the ideal of good government that the empire guaranteed to all its dominions. The imperial organization that resulted from this concept was established in the various territorial councils. In the early sixteenth century there were two, for Castile and Aragon; the Council of the Indies was formed in 1524; the one for Italy in 1555; the Portuguese one in 1582, when the two crowns were joined as the Iberian Union; and the Flemish one in 1588. Before the two crowns were joined, the Portuguese Empire had two territorial councils, for Portugal and the Indies; the latter's autonomy would be preserved even after Spain and Portugal came under one monarch. In this empire under construction, Castile and southern Portugal were to supply the manpower, financial means, and organizational models for the New World. In fact, the American territories-or West Indies-ceased to be the personal property of the king only in 1519, when they gained the right to their own territorial council, the Council of the Indies. Although the council inherited the legal and institutional traditions of Castile, it produced new laws and institutions because it was forced to take into account Amerindian common law. The new status of the West Indies in this second phase of the invasion corresponded roughly to the rise of the Spanish monarchy under Charles V. Central to this process was the disappearance of the old expeditions authorized by royal functionaries and the requirement that capitulaciones, or contracts between the monarchy and potential conquistadors, now be authorized by the Council of the Indies. The institutional tightening is visible above all in the king's greater oversight of officials and of the conquistadors' plunder, as well as in the king's defeat of the organized rebellions of the conquistador titleholders, such as Gonzalo Pizarro in Peru (1543) and Martin Cortés in Mexico (1566). The new governing of the New World was more effective than previously thought, although of course it did not bring justice or, much less, equality of rights for Amerindians. The tighter royal control held in check the seigniorial tendencies that had flourished during the invasion of the Antilles and introduced the imperial organizational principle to America. The king's strengthened authority (not to be confused with the beginning of absolutism) inspired in Spanish and native subjects alike the idea of the king as the guarantor of the rank-based liberties that had taken root in the various American territories. Because the colonies could not regularly convene in the Cortes, deputies from the leading American cities defended these liberties in the king's court. The fact that America was no longer the personal property of the king, and that it was becoming an integral part of the monarchy, conditioned the course taken by this second wave of invasion. Moreover, on the American continent the invaders would confront better-organized Amerindian societies that could respond politically and socially. The conquests of first Mexico and then Peru thus marked a significant turn. During the Iberian invasion, the so-called Spanish conquest, the conquistadors captured the principal centers in less than thirty years, from 1519 to 1550. The occupation proceeded by gemmation: once an important center such as Tenochtitlán (Mexico City) was seized, further expeditions branched out from it, taking new territory and creating a network of Iberian settlements. Four centers branched out from Santo Domingo: Panama (1519), Mexico (1521-24), Peru (1534-35), and Buenos Aires (1536-37). The occupation of vast territories started from these settlements and was organized with small bands of Spaniards. The penetration of the Mexican hinterland was quick: in twenty-six years, from 1521 to 1547, the central part of Mexico-which was the heart of the Mexica, or Aztec, Empire-passed into the hands of the invaders. The invasion of the Andean territory was not much different. Between 1534-35 and 1550 the Spaniards extended their control to the Andes and branched out into Chile. They followed a similar path in Río de la Plata; moving up the river between 1536 and 1553 they occupied the inland areas up to the foot of the Andes-today's Tucumán. In Brazil the invasion took on a different rhythm. As late as 1550 the donation of territories to the Portuguese nobility had not led to the founding of important centers of territorial control. Only three settlements, Pernambuco, Bahia, and São Vicente, showed some dynamism. In 1540 the Portuguese had failed to stem French infiltration; it would subside only after the kings of Portugal and France had signed a peace agreement. The Spanish invasion was faster than the Portuguese, thanks to the Spaniards' underlying structure. Portugal used the donataria system, which became the norm at the time of the most intense French penetration; the donatários (recipients) were granted hereditary captaincies over about fifty leagues of coastline as well as inland territory of unknown size. The cartographic reconstruction of the Brazilian seigniories indicates that the lands assigned to the donatários were colonized by them at their own expense in exchange for such rights and privileges as the governmental, administrative, and judicial control of the captaincies, direct rule of vast expanses of land, and authority to grant land to their own subjects. The king's authority was limited to the trade monopoly of precious wood and spices and the levy of taxes on precious metals and diamonds. In contrast, the Spanish monarchy perfected the capitulación, the legal instrument that gradually replaced the now annulled privileges originally granted to Christopher Columbus and his heirs. This type of agreement obligated the licensee to explore, settle, and populate the grant territory at his own expense. These operations were entrusted to a conquest expedition organized by the grant holder (the conquest captain), with no financial or military support from the crown. The capitulación formally set forth the rights and duties of the captain and his men. Among the rights was the appointment of the captain to the office of governor and the possibility that he would be granted a title of nobility. Both he and his men were exempted from taxes, and the men were given official and municipal positions, in addition to being awarded lands and an inheritable income derived from the tribute that the Amerindians paid to the king. The conquistadors were subject to the king's laws and to the authority of the royal officials in charge of overseeing the levying of taxes and duties. Finally, the king could suspend or revoke any of the rights he had granted. Not only was the capitulación adopted by the Spanish monarchy easier to control, but it was also a more flexible tool than the Portuguese system. The capitulación expired if not acted on promptly, whereas the Portuguese donataria could be transferred to a third party. The greater flexibility and incisiveness of the capitulación, together with tighter control by the officials and priests engaged in the conquest, forced the expeditions to reach their goal as swiftly as possible. Among the methods they adopted were formal, but also forced, alliances with the Amerindians, which allowed the conquistadors to move freely about the territory and, with the aid of interpreters, take full advantage of intertribal rivalries. No doubt the Iberians' skill in drawing the natives into their enterprise was useful for colonizing purposes. Another significant factor in the conquest-one that is often overlooked-was the individual set of abilities that the different captains demonstrated. In spite of obvious similarities in the conquests of Mexico and Peru, the martial and political styles of Hernán Cortés and Francisco Pizarro were vastly different. So too were the skills of Pedro de Valdivia, who conquered Chile, as compared to those of Juan de Garay, who occupied Paraguay. But beyond those who won preeminent positions in the new society were the many Iberians, the españoles pobres, who failed to make a fortune. This large group is important because it supported the nascent municipal institutions, helping to check the feudal intentions of the captains and, more generally, of the encomenderos, the lifetime beneficiaries of Indian tributes. Invasion and conquest are terms associated with violence, abuse of power, and illegality. The level of violence during this phase of the invasion, although certainly great, was less pronounced than in the initial phase, not just because mixed-race unions were becoming more commonplace but also because the poorer conquistadors and the Indian notables were thwarting the feudal tendencies of the more powerful conquistadors. Another factor was the failure of the Antillean experience. The resistance to the conquistadors' ruthlessness meshed nicely with the Church's moderating efforts, in particular the work of the Dominican, Franciscan, and Augustinian orders and of the secular clergy. Their work transcended the religious sphere, since the hundred or so monasteries active in New Spain in the 1570s not only gave shelter to the indigent but also disseminated European culture and agricultural methods to the native populations. Accounts by the Indian notables and the conquistadors, such as the reports that Hernán Cortés wrote to Charles V, shed light on the many cultural and social adaptations in this early conflict-ridden phase. They portray an Amerindian and Spanish world shot through by tensions, one in which any alliance or understanding between the two peoples could not last because it was motivated by limited, short-term goals. The Indians showed great skills in exploiting the conflict among the Spanish captains, supporting one to weaken the other, all the while knowing that this tactic did not amount to a strategy. Against this background of partial alliances and ententes, several political projects developed that would help bring about a new order. An example is Cortés's plan, which he laid out in his reports to Charles V. Cortés begins by criticizing the invasion of the Antilles, hoping to prevent repeating the same mistakes in Mexico. That is, the Spaniards should not "exploit and destroy it, only to abandon it," but rather should lay the groundwork for a future "great and noble land where God Our Lord shall find and gather thousands of faithful and Your Majesty shall reap great rewards." Cortés's plan (his enemies would accuse him of lèse-majesté) revolved around the idea of a permanent "alliance" with the Indian lords. He applied this idea when, after imprisoning the emperor, he "restored the office of lieutenant held at the time of Moctezuma" to a Mexica nobleman and appointed other notables to "city government posts, in accordance with their customs." In this way, Cortés concluded, "I did all in my power to honor them and grant them privileges, and they returned the favor" (Cortés 1970). Cortés's plan was in harmony with the emerging reorganization of the Spanish monarchy in an imperial system that subsumed a number of different kingdoms or provinces without destroying their internal autonomy. These ideas also appear in the writings of an Inca nobleman, Felipe Guamán Poma de Ayala, the author of one of the most extraordinary accounts of the conquest, Nueva corónica y buen gobierno (New Chronicle and Good Government), which he wrote in the early seventeenth century. Poma de Ayala developed the idea of a kingdom in which each province (the four parts of the ancient Inca Empire) is governed by Amerindian lords, while an emperor sits in the center, in Cuzco, the Inca capital. This emperor is none other than the Spanish monarch, at once also the Inca emperor, thanks to Huáscar's abnegation in his favor. The invasion of the American continent entailed enormous challenges, both material and cultural, that forced the conquistadors to adapt and react flexibly to the new demands. A similar process also occurred in the conquered populations; just a few years after the invasion, they were mastering the invaders' language and in some cases even using the Spanish alphabet to transliterate their mother tongue. Many intermediaries participated in this interaction, foremost among them the clergy, who, notwithstanding the destruction wrought in the name of the faith, saved a significant part of the Indian heritage. Like the first phase, this phase of the invasion began with acts of force on the part of Iberian armed bands, but it eventually led to a variety of economic, social, political, and cultural phenomena of adaptation and connection between the conquerors and the conquered. Both sides were thrown into a mutual learning process, which extended even to war practices. Soon the Indians, the nomadic tribes especially, mastered horseback riding and became mobile, a custom that for many tribes would last until the nineteenth century. Thanks to the progressive assimilation of Iberian novelties such as the horse and the spread of semiwild livestock, nomadic and semisettled Amerindian populations successfully slowed the Iberian advance in the outlying regions, starting in the second half of the sixteenth century. Likewise, contact with the natives taught the Spaniards and the Portuguese to rely less on firearms, since gunpowder was inefficient in a humid, tropical climate and cannons were difficult to move. As a result the most effective Iberian weapons on the battlefield became the crossbow, spear, and sword; the Iberians also found horses and dogs useful in battle. The Other West provides a provocative new interpretation of Latin American history and the region's place in the changing global political economy, from the discovery of America into the twenty-first century. Marcello Carmagnani's award-winning and multidisciplinary analysis sheds new light on historical processes and explains how this vast expanse of territory--stretching from the American Southwest to the tip of the Southern Cone--became Europeanized in the colonial period, and how the European and American civilizations transformed one another as they grew together. Carmagnani departs from traditional historical thought by situating his narrative in the context of world history, brilliantly showing how the Iberian populations and cultures--both European and American--merged and evolved. Marcello Carmagnani is Professor of Politics at the University of Turin, Italy. Rosanna M. Giammanco Frongia, a former sociology teacher and author, has translated numerous books on politics, art, sociology, and religion, including Paolo Cesaretti's Theodora: Empress of Byzantium.